Sarasota FL - Star2Star Communications, provider of the World's Most Complete Cloud Communications Solution with options ranging from Hosted to Hybrid, announced today that their innovative Hybrid Architecture has been recognized with the 2017 TMC Labs Innovation Award from CUSTOMER Magazine. This marks their fourth consecutive year receiving the Innovation Award. TMC Labs' Innovation Award honors the latest technology products that demonstrate innovation and unique features, and only companies who demonstrate ground-breaking contributions to the communications industry receive this distinction. "Elevating the customer experience is always a foremost thought when we enhance our solutions," said Michelle Accardi, Group President and Chief Revenue Officer of Star2Star and Blueface. "Star2Star was founded on innovative technology that revolutionized how our customers communicate by combining the best of on-premise and cloud-based solutions. As we have grown, we have improved upon our original technology and have added more products that boost productivity like our fully hosted solution, StarSystemTM Hosted, and our StarPaaS integration platform." 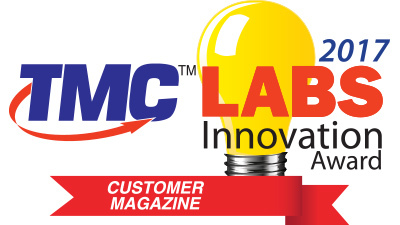 Rich Tehrani, CEO, TMC, added his congratulatory comments: "Congratulations to Star2Star for being granted a 2017 CUSTOMER Magazine TMC Labs Innovation Award. Their Hybrid Architecture has been selected for demonstrating innovation, superior quality, and unique features which have had a positive impact on customer-related technologies."